It's not really a magma chamber, 'cause those are located hundreds of kilometers bellow the earth's surface. But this humongously enormous vault once contained a volcano's magma, and then the magma disappeared back into the earth, likely through a fissure. Normally, the chamber would have collapsed, forming a crater. This vault did not, due to its stronger structure similar to an arch. 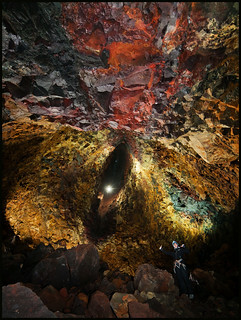 The Inside the Volcano tour here in Iceland. It was an unbelievably amazing experience to be there, and when our turn came to go back to the surface, I really felt I was not ready to go. I could have stayed there two hours more. As for the shooting, it pays off to bring something to clean the lens from the dripping, and the flash is actually not necessary if you have a bright lens and high iso. A bean bag could pay off. The shiny light in the middle of the image is the cable lift being brought down with some more visitors.